As we continue in our series of building a home from the ground up, we will talk about the importance of key points in the structure of the home that can literally make or break a house. While these things will go unseen once the home is completely built, their absence would surely be noted if they were not present. They are literally what the weight of the home is resting on. When you have an opening, such as with a door or a window, you must have a header for support. It needs to be strong enough to carry the load above it. Headers take the weight of the materials and occupants above and transfer it via the trimmers down to the floors and foundations below. The longer the opening, the larger header it requires. 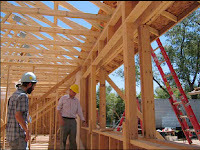 Bearing walls (those that carry the weight of joists and trusses) require larger headers than nonbearing walls. The posts and beams support the overall frame of the house. The beam runs horizontally and supports the weight of the house and must be strong. The post runs along the house vertically and is planted firmly in the foundation of the home for support. Floor joists are slightly smaller than beams and aid in supporting the structure of the home. They are horizontal and run from wall to wall, wall to beam, or beam to beam in support of a ceiling, roof, or floor. Floor joists alone frequently fail under a heavy load. To combat this problem, cross bracing is often used between the floor joists. Typically the cross bracing is done approximately every eight feet. Cross bracing can be made of either wood or metal. They should be installed before installing the subfloor. This ensures the floor joists are properly spaced. It will also help with the subfloor installation. Some builders leave cross bracing out, yet it is an important element of a well-built home. While these things might seem minor when you view a house being built, they are in fact an absolutely essential part of the structure of the home. If these areas are poorly built, the home will not be strong. Therefore, finding a builder that puts the appropriate emphasis on the headers, posts, beams, joists, and cross bracing is crucial.